Canadian ice dancers Tessa Virtue and Scott Moir have recorded great exploits in the sports of skating and ice dancing and have their names enlisted as one of the world’s highest dance teams ever. Tessa Virtue and Scott Moir started building their pedestal after winning the Olympics for the first time in 2010. Besides the Olympics, they have also become a household name in the World Figure Skating Championships, having amassed lots of awards and accolades on the reputable skating platform. Are they the greatest dancers of all time? Many stakeholders have said yes to this question and this mostly has to do with the pair’s impeccable achievements and overall excellence as skaters. Having said this here is all you need to know about the longest-standing ice dance team. Tessa was born on May 17, 1989, in London, Ontario, Canada to her parents Kate and Jim Virtue. She is an alumnus of Holy Names High School in Windsor. Virtue has always loved to dance. At a very young age, she knew what she already wanted to be. Growing up, she was greatly involved in sports, training in gymnastics and others. But this did not stop her from getting an education. Virtue attended the University of Windsor where she studied psychology and is said to have finished from the University of Western Ontario. Skating and ice dancing for Tessa started long before she went into the professional platform. By the time Tessa Virtue made her debut with Scott at the 2003/04 Junior Grand Prix, she was warming up for an unforgettable encounter with notable skating coaches Igor Shpiband and Marina Zueva. Before dwelling on her skating journey with Scott, let us get to know more about him. Scott Moir was born on September 2, 1987, also in London, Ontario, Canada. For Moir, skating is a way of life in his family. Growing up with an older brother like the popular ice dancer Danny Moir and a coach Alma Moir, his mother, there was no way he could have escaped the skating path even if he wanted to. Scott got his high school education at Medway High School in Arva Ontario. Now to the interesting skating journey; As early as the late 90s, Tessa Virtue and Scott Moir were skating together. They were paired for the first time by Moir’s aunt, Carol Moir in 1997, and since then, they have been skating together. Carol was their coach at the time but soon enough, they trained with Paul MacIntosh and Suzanne Killing. In 2004 they both moved to Michigan US and started training with Igor Shpiband and Marina Zueva. After making their Junior Grand Prix entry in the 2004/04, they grabbed the junior title at the 2004 Canadian Championship and qualified for that year’s World Junior Championships. They got to the senior level in the 2004/05 season albeit at the national level. Internationally they remained juniors. That same year, they won the silver medal at the World Junior Championship. Tessa Virtue and Scott Moir made their Grand Prix debut in the 2006/07 season at the Skate Canada International that year and bagged the silver medal. 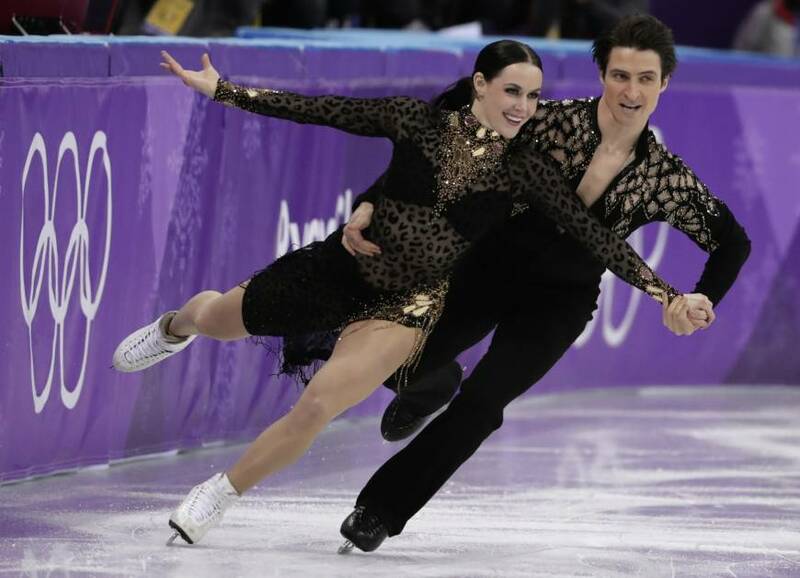 The dancing duo made their Olympics debut at the 2010 Winter Olympics. At the competition, they secured a gold medal after recording a total score of 221.57 above other notable contenders. They maintained the standard by winning the 2010 and 2012 World Championship. They also won the silver medal at the 2013 World Figure Skating Championships and were also the silver medallists at the team trophy and ice dance competition at the Winter Olympics in 2014. Scott Moir and Tessa Virtue took home gold at the 2018’s Winter Olympics Pairs Ice Dance. They look like a couple, dance like a couple and even act like they’re a couple, but ice dancers Tessa Virtue and Scott Moir have said often times that they are not. The duo has left their fans wishing and anticipating a positive assertion or affirmation on their relationship status. For the media, it has indeed been a seemingly endless hunt for tangible information to invalidate the dancers’ refutation of the widespread speculations. For two people who have known each other for more than 20 years, it would be quite difficult to convince the public that nothing has happened or is happening between them. What makes it even more confusing is the fact that neither of the two is married. Even though Tessa Virtue has been linked with ice skater David Pelletier, the latter is now her ex. So the question ‘Are they in a relationship?’ continues to linger. Some sources have said that the two had dated even before they hit their teens. That could be true or false but wouldn’t come as a surprise if true. What the public really wants to know is if the pair are romantically together. Tessa has been quoted as saying that she is so committed to her sport and would make a bad romantic partner for anyone. For Scott, he has once confessed that skating with someone who isn’t his skating wife is tough. So where does this leave everyone? Definitely still wondering and hoping for juicy information about the ice dancing pair.